I have tonnes of things to finish, and yet here I am watching my fingers tap dance on the keyboard as I think about meeting our loved ones after almost a year. Sometimes I feel this anticipation, the bubbling excitement and the unexplainable joy before the trip is the best part than the whole trip itself! It reminds me of a quote I had read a long ago and imprinted in my memory. It goes something like, ‘do not care much about the destination, but simply enjoy the journey’. I can’t keep procrastinating and have to finish packing today, as it’s just couple of hours left for our flight. I need to go through the list to make sure we don’t leave them behind. I need to tend to our indoor plants and make sure they survive without our tender care for the next three weeks. I have just a couple of hours to finish the final dusting, cleaning, cooking and dozens of last minutes things to do. Before I say adios, I have a recipe to share. 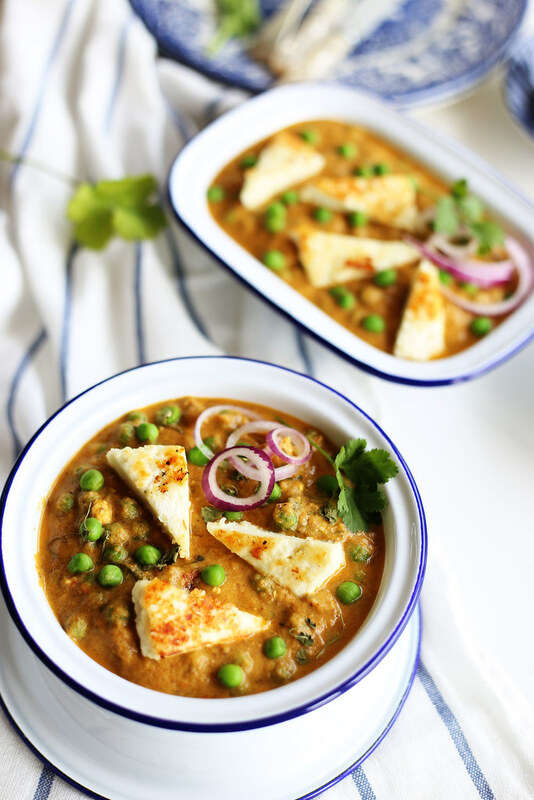 It is Matar Paneer Kurma or Matar Paneer Korma, a mildly spiced peas and Indian cottage cheese simmered in a creamy and delicious onion and yogurt gravy. 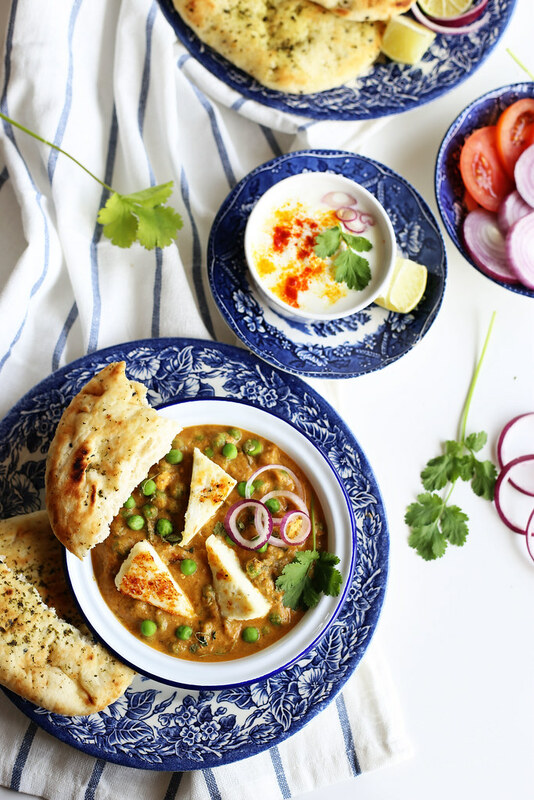 According to Wikipedia, the word “Korma” is derived from Urdu ḳormā or ḳormah, meaning “braise”, derived in turn from Turkish kavurma, literally meaning “cooked meat”. 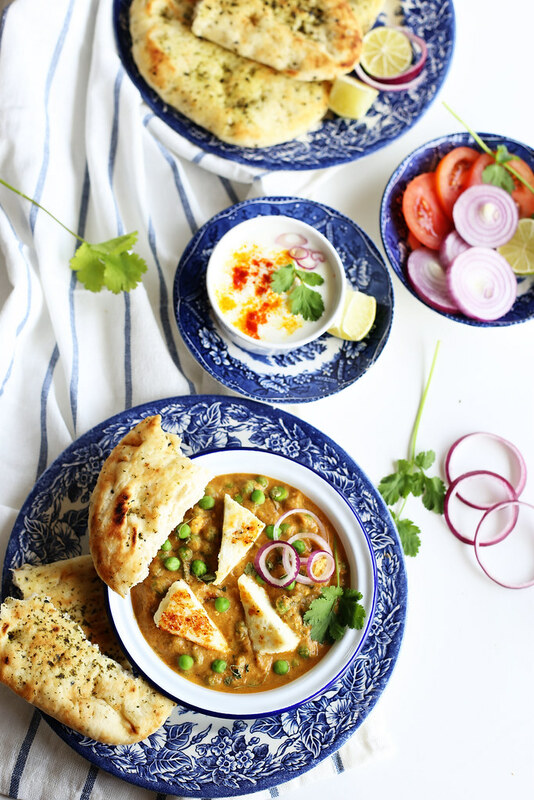 Korma has its roots in the Mughalai cuisine of Indian subcontinent dating back to 16th century, where meat or vegetables are braised with water, stock and yogurt or cream. 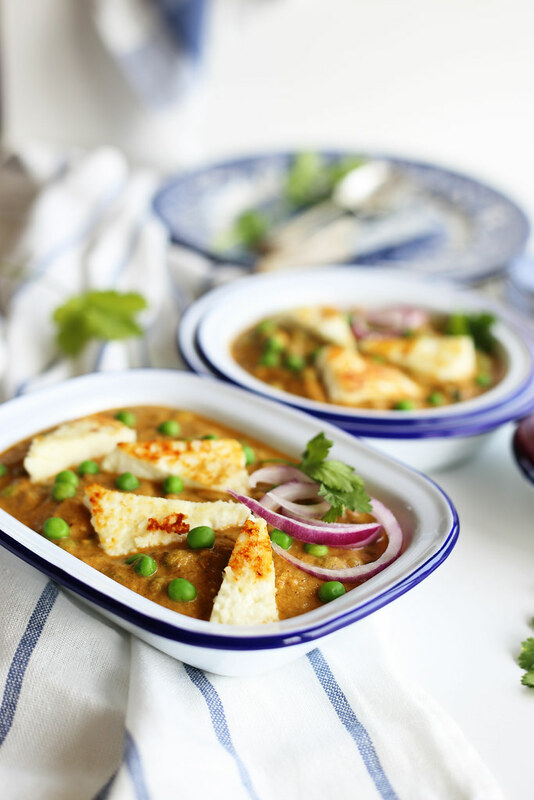 The flavour of a Korma or Kurma is based on a spice mixture combined with yogurt and cooked carefully below curdling temperature by incorporating slowly with the meat or vegetable juices. See you folks on the other side of the globe! I am not sure if I will get an time to update the blog with my rants or recipes. Please follow me on Facebook or Instagram you want to catch up with my travelogue. My social network feed is going to be filled with the vibrant colours of India and her glorious food! :) Till the, stay healthy and happy. Chop onion and tomatoes roughly and keep them aside. Whisk the yogurt to remove any lumps and keep it aside. 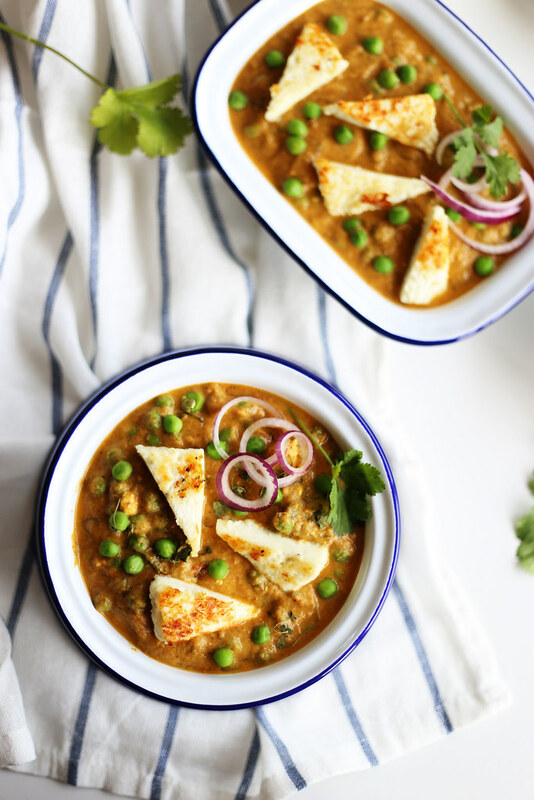 Cut the paneer into 1 inch squares or triangles of 1 cm thick pieces. Heat the griddle or tawa and spread 1 tbsp. oil or ghee. 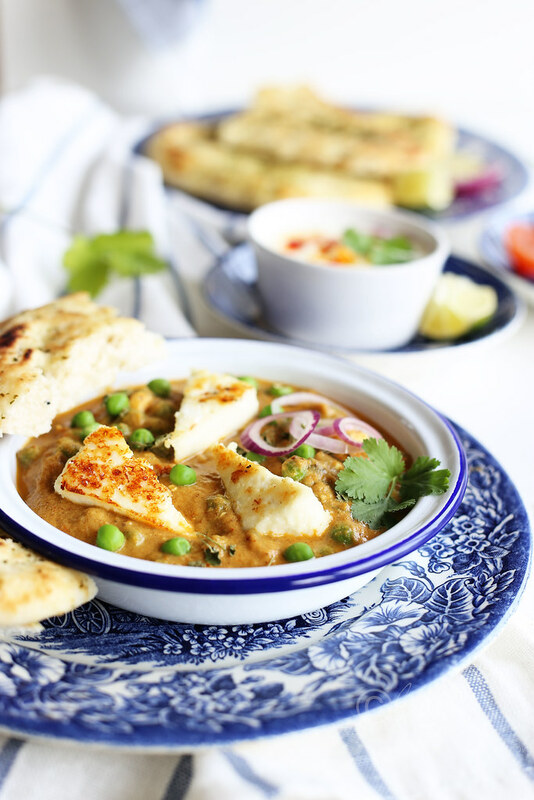 Place paneer pieces on heated griddle in a single layer. 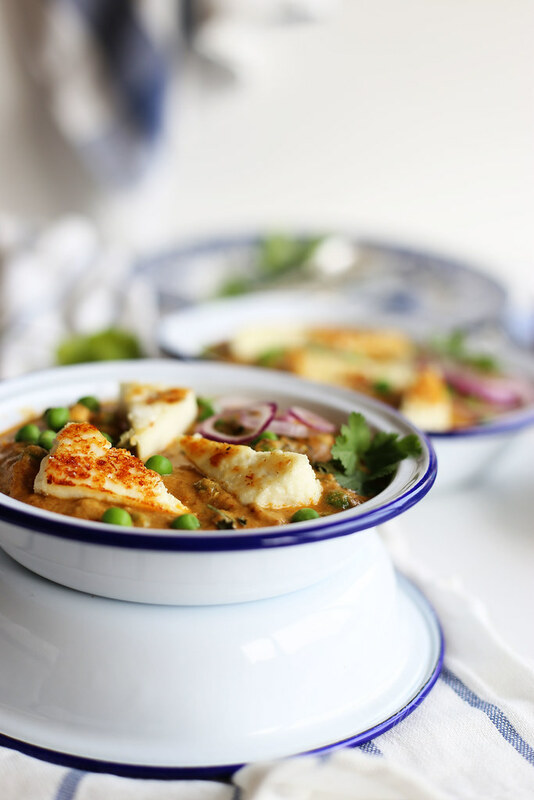 Fry the paneer pieces on both sides until it turns golden, about a minute each. 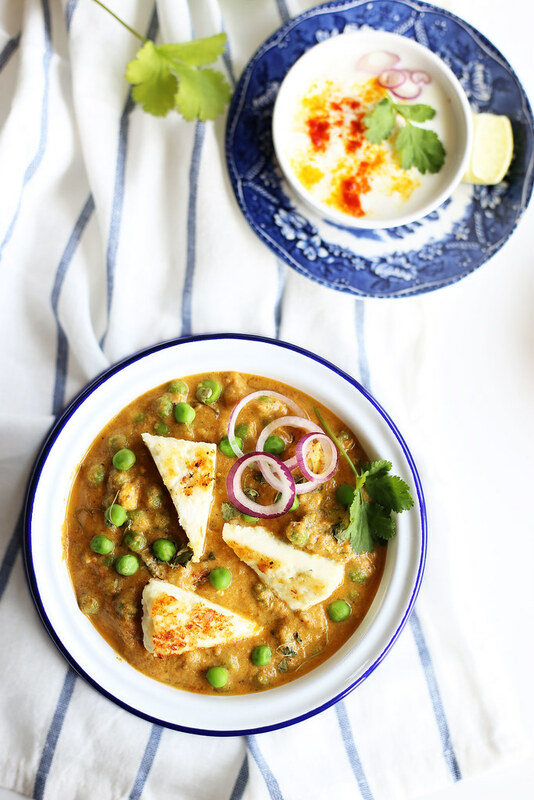 Keep the fried paneer pieces immersed in a bowl of hot water. This helps in keeping the fried pieces stay soft. 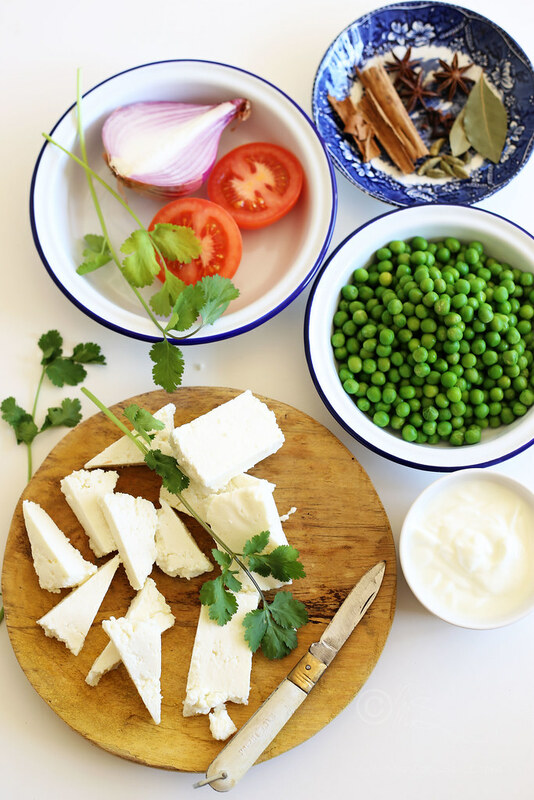 If using a fresh green peas, boil 2 cups of water and add washed fresh peas. Cover and turn off the flame. Let the peas sit for 5-6 minutes. Drain all the water passing through a colander and refresh the peas by rinsing them in ice cold water. Alternatively you can steam them for 4-5 minutes. Keep them aside until needed. Heat 1 tbsp. 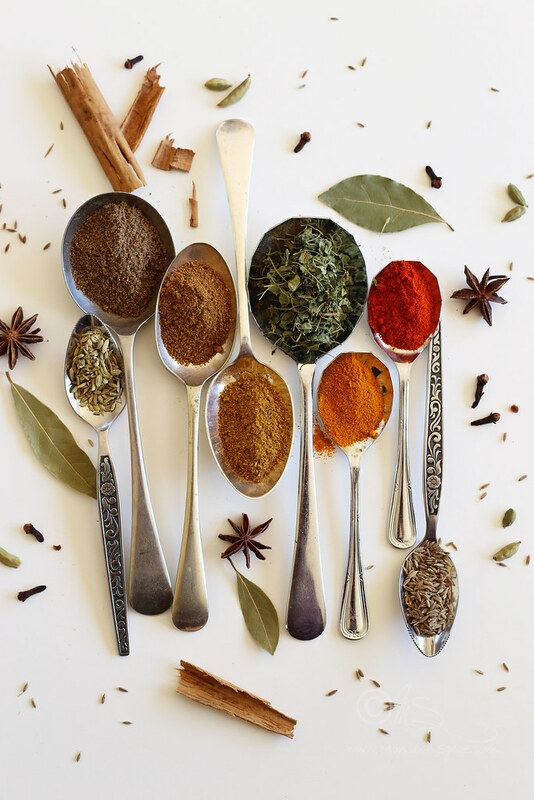 oil or ghee in a pan and add cinnamon, cloves, green cardamoms, star anise and bay leaf. Fry the whole spices for a minute on a medium flame. Add cumin seeds and fennel seeds and fry them until cumin seeds sizzle and turn deeper shade, about 1 minute. Mix in roughly chopped onions, sugar and ¼ tsp salt. The sugar helps in caramelising the onions while the salt speeds the cooking of onions. Sauté the onions on medium flame until the edges turn golden brown, about 2-3 mins. Add ginger-garlic paste and sauté until the raw smell disappears, about 2 mins, on medium flame. Next add the chopped tomatoes and cook until the tomatoes turn pulpy and releases its juice, about 2-3 mins. Turn off the gas and let the mixture cool down to room temperature. 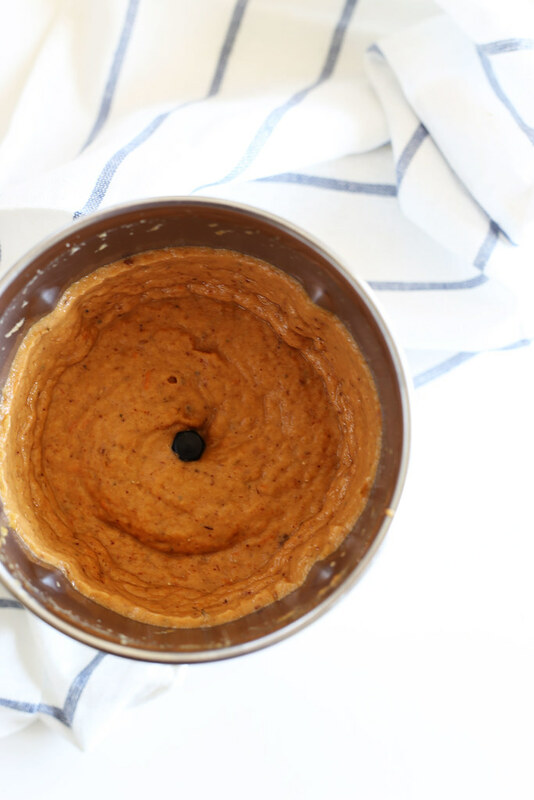 Once the mixture is cool, grind it to smooth paste without adding any water. Heat ½ tbsp. oil or ghee in a pan and add ground onion-tomato paste. Fry the paste on medium flame for 3-4 minutes until the moisture is absorbed and the oil oozes from the side. Next add turmeric powder, red chilli powder, coriander powder and kitchen king masala and mix them well. Add whisked thick yogurt and mix them well. Keep stirring the mixture for a minute or two. Add about 2-2½ cups of water and bring the gravy to gentle boil, about 4-5 mins. Once the gravy comes to gentle boil, add the peas and salt to taste. Let it cook covered for 2-3 minutes. Add fried paneer pieces, garam masala and dried fenugreek leaves crushed between fingers. Add about ½-1 cup of water if you find the gravy too thick. Lower the heat to low and let it cook uncovered for 4-5 mins. Turn off the heat and mix in finely chopped coriander leaves. Cover and let it rest for 10-30 minutes for all the flavours to blend well. Gently heat the curry before serving. 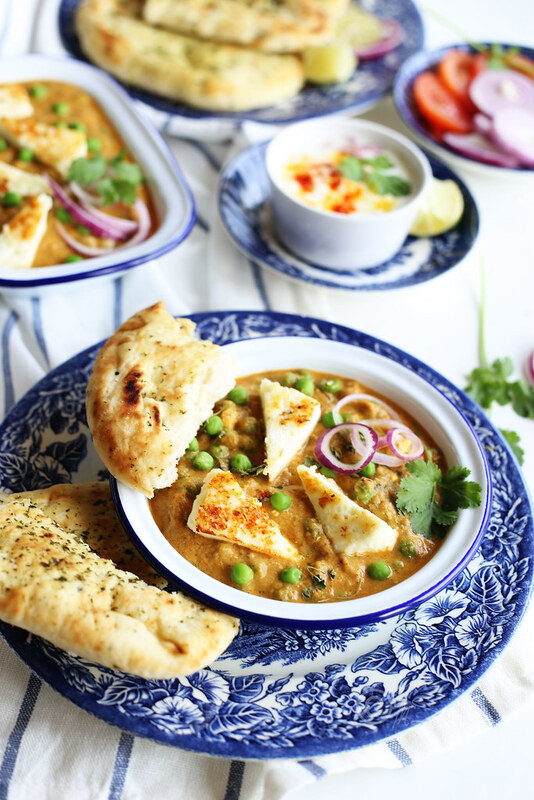 Serve this delicious creamy Matar Paneer Kurma with With any Indian flat breads (Whole Wheat Naan or Butter Naan or with any stuffed parathas) or plain/flavoured Basmati rice and enjoy! 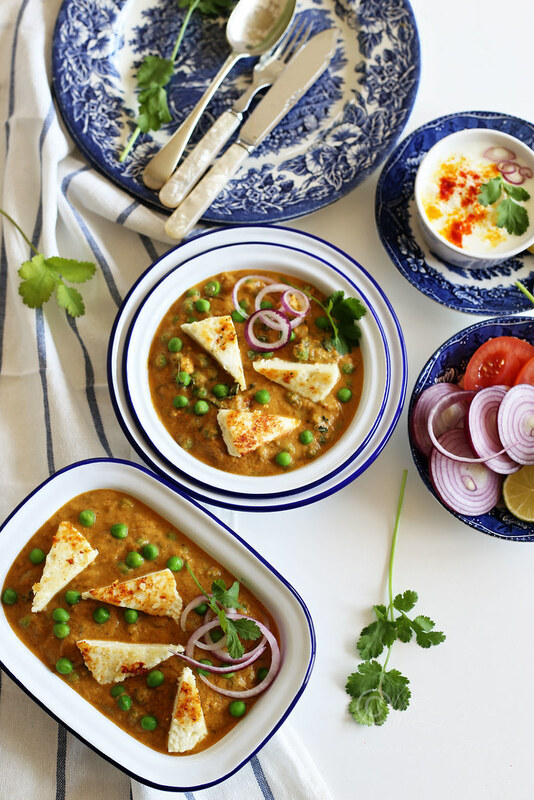 Keep the fried paneer pieces immersed in a bowl of hot water. This helps in keeping the fried pieces stay soft. When cooking the onions, add about a tsp of sugar and a generous pinch of salt. The sugar helps in caramelising the onions while the salt speeds the cooking of onions. I can so much relate with the topic of planning, shopping and packing when heading to India, it's such a nice feeling many a times hard to express. Have a safe Journey Sia. 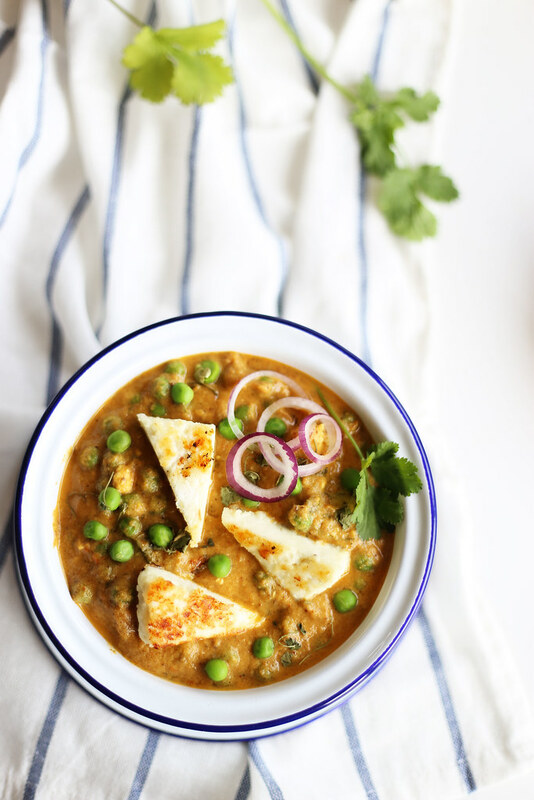 The kurma is a nice variation from the usual matar paneer that I make,your photos are top class Sia !! Please do keep me posted if you ever decide to try this recipe. It is simple and easy to make and loved by all in my family. I am not able to follow you on Instagram. Is there some problem with your Instagram account? 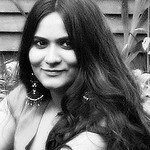 Sandhya, as far as I know there's no problem with the account. In fact I got few followers today on Instagram. May be you need to reinstall the app as it may be outdated?! Or just logout from your Instagram account and log in again and see if it works. Just a thought.